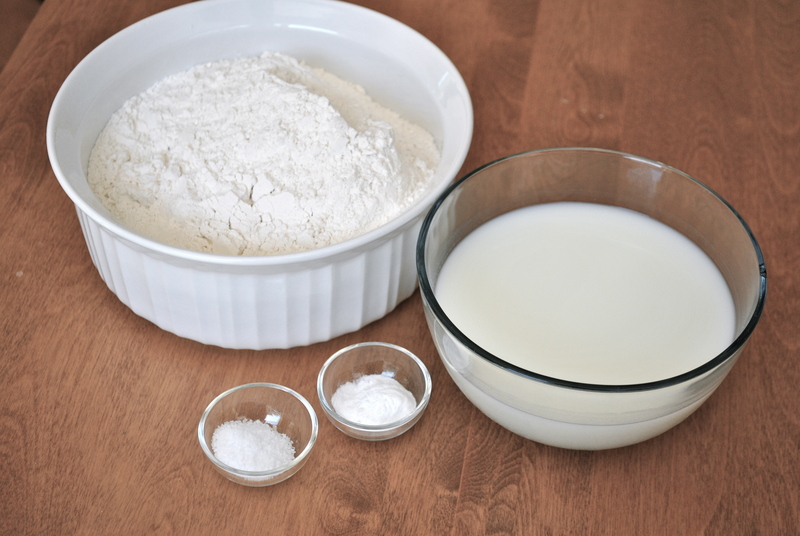 **Usually, I need 1½ cups when I make bread with 4 cups unbleached flour and up to 1¾ cups when I use 2 cups all-purpose and 2 cups wheat, but it depends on humidity. 1. Cover the dutch oven and place it reheat oven to 450. 2. 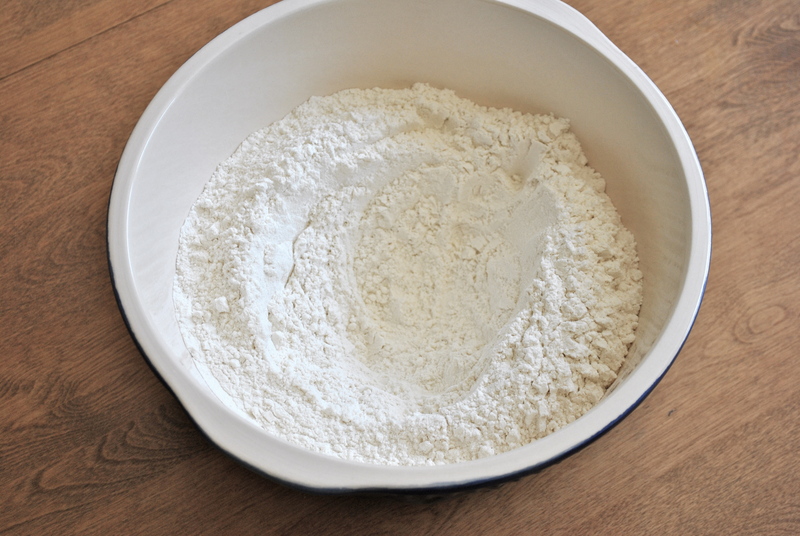 Sift the flour, baking soda and salt together into a large bowl. Kosher salt is usually too large to sift so I sprinkle it on the sifted flour and baking powder. I like to use a large ceramic bowl. It makes me feel more farm-kitcheny. My glass and stainless steel mixing bowls just don’t give me the same feeling. Make a well in the center. paddle to gradually mix the flour mixture into the buttermilk. each circle until you get to the wall of the bowl. When finished, the dough should feel soft, but not sticky. 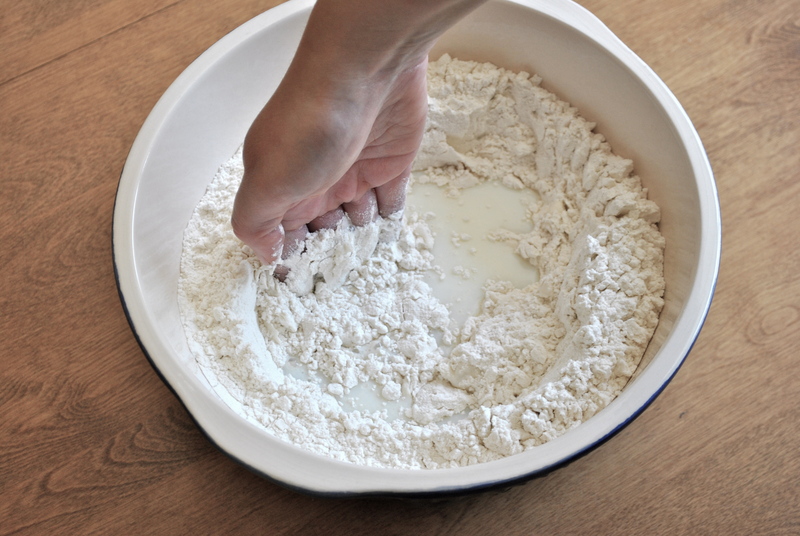 If it is sticky, sprinkle flour over the dough a tablespoon at a time and mix but do not knead. If the dough is too dry add more buttermilk a tablespoon at a time. You should not need more than 1¾ cups buttermilk. 5. 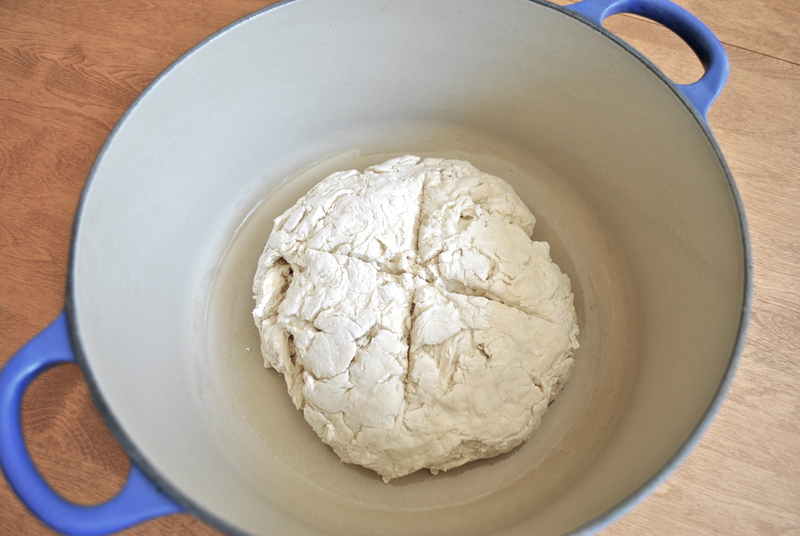 Here’s the thing with this dough: it will be shaggy and crumbly. 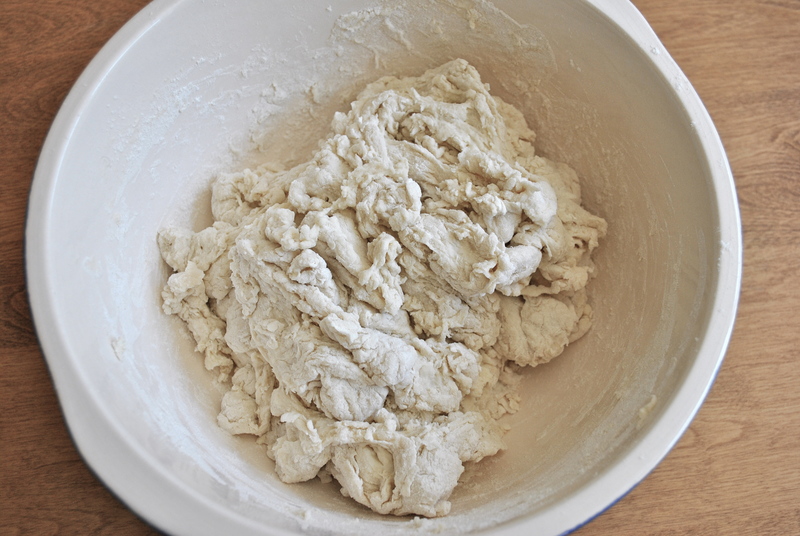 It will look like a complete mess and it will not form a perfect ball of dough. In fact, you are going to look at this soft lump and think, “You’ve got to be kidding.” Don’t worry, it will work. 6. 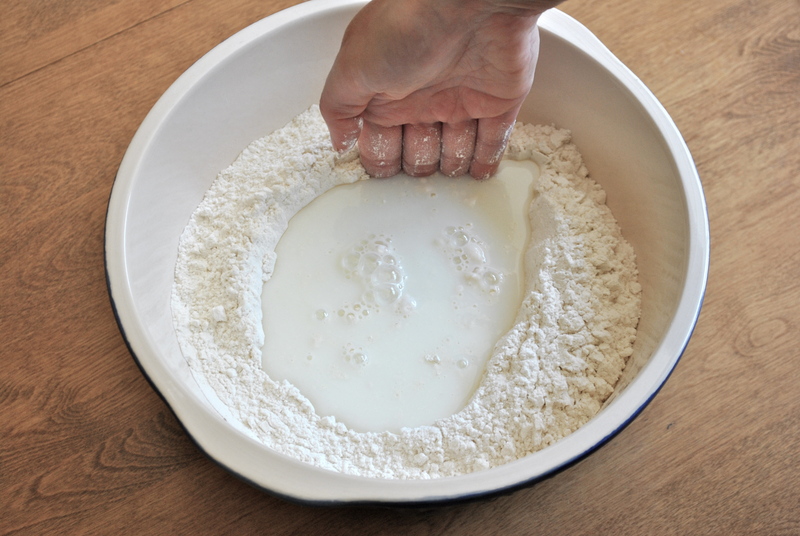 Wash and dry your hands then turn the dough out onto a clean, floured surface. 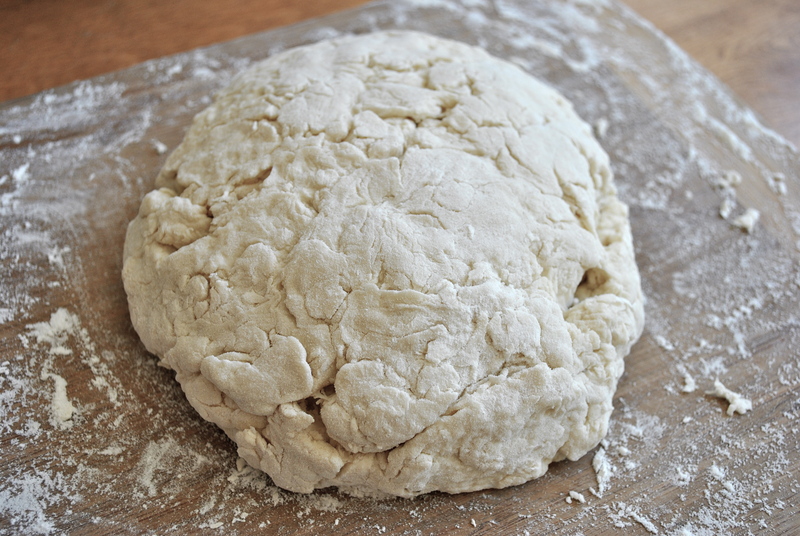 Gently roll and pat the dough into a flat ball that is about 2 inches high. Do not knead the dough or mess with it too much or the bread will be tough. 7. Remove the Dutch oven from the oven and place the dough inside. cross in the loaf from side to side and poke a hole in each quarter. Cover the pot and return it to the oven. Scoring the bread allows it to expand while it bakes without losing it’s shape. If you do not have a Dutch oven, place the dough on a baking sheet, cut a deep cross in the loaf from side to side and poke a hole in each quarter, and place in the preheated oven. for another 25 to 30 minutes until the bread is crusty with a pretty brown to it. Enjoy your bread the same day for best taste and quality. Please remember that this bread does NOT have commercial preservatives in it so it will not stay fresh for days even if you put it in an airtight bag. You can freeze an uncut loaf of bread if you wrap it really well. This entry was posted in Bread, Recipes and tagged Alice Waters, bread, recipe. Bookmark the permalink. I’ve always wanted to try this, now that I know how easy it is to make, I shall. Except for the buttermilk, don’t keep that on stock. The internet says that I can use regular milk with a little vinegar, but I don’t know if that would be as good. I apologize, Dylan, I just found your reply. Yes, milk and vinegar are the common substitute for buttermilk. I just didn’t think to say that because I never use it. I’ll try to be more on top of my game. 🙂 It will definitely work in this recipe, but it may not work in others. For example, Red Velvet cake never turns out right if you make the substitution. 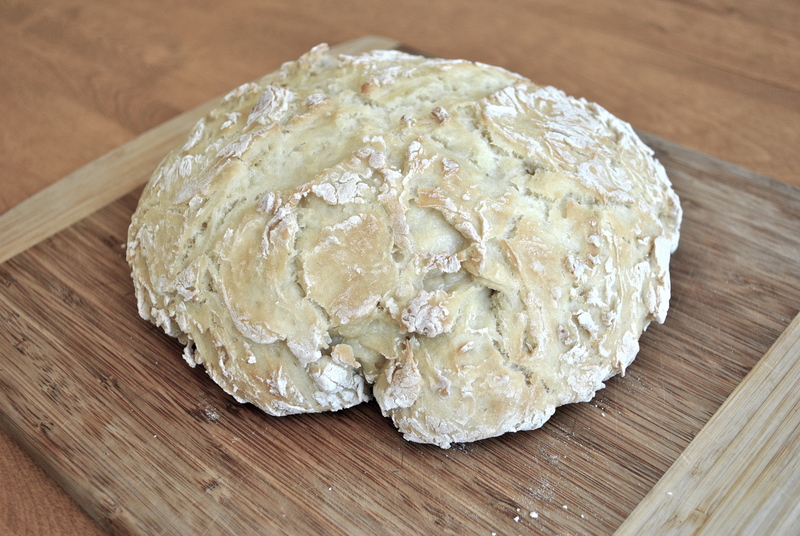 Soda bread is meant to be simple and easy- LOVE IT!!! Glad to see your recipe you use has only the 4 ingredents- that is traditional. Thank you for posting an alternative cooking method! It helps make cooking more accessible for all. I made some tonight and it was amazing. I used the milk and vinegar and I didn’t use a dutch oven, I used a Cast Iron Skillet. So I had to reduce the temperature and use foil to cover. ROCK ON!! Thank you for posting alternative ideas! What did you reduce the temperature to? And I cooked it for a tad bit longer. The bottom of the crust was kinda tough, but it was still good. If I ever make it again, I’ll use some of the enameled cookware we have somewhere. I think they’re in the Garage, but I wasn’t about to go digging around the garage at that time of night.